In some naturally warm, humid climates, humidifiers are likely not necessary. But in many areas, there are at least some months when the humidity levels drop, sometimes significantly. This presents a unique challenge: use a humidifier and risk creating mold or go without and cope with the discomfort an extremely dry climate can cause. In this post, we will show you how to safely add a humidifier to any home environment without risking mildew or mold growth. For most individuals, the ideal range of humidity in the air spans from 25 to 50 percent. But in the cold season, humidity can drop to just 10 percent or lower. This can cause uncomfortable symptoms, including irritated nasal passages, nosebleeds, itchy eyes, dry flaky skin, thirst, and similar issues. There are a number of different types of humidifiers to choose from, each with its own advantages and disadvantages. Often, which humidifier model to purchase is personal, and there is no one right or wrong choice. The steam humidifier is one of the most common types and also tends to have the lowest price. This type of humidifier vaporizers water into steam (which is why it’s called a "vaporizer" instead of a humidifier). Pros: The action of vaporizing the water can also neutralize any microorganisms present in the water. Cons: The steam is very hot, meaning this type may not be safe for kids or pets. An evaporative humidifier uses a "wick" filter to attract water into the filter (the "wicking" action). Then the water is turned into moisture and an internal fan blows it out into the room. This is also a very common type of humidifier. Pros: There are different fan speeds to adjust the level of humidity for different room sizes and needs. These humidifiers are very efficient. Because mist is cool, they are safe for kids and pets. Cons: The wick filter needs to be cleaned or replaced regularly. Mist is cool rather than warm, which may not suit some people and causes a risk of microorganisms. They can be noisy. This newer type of humidifier turns water into steam using a high frequency vibration. Pros: The fine mist can be especially soothing to breathe in. They are very quiet. Cons: Because the mist is cool, it carries a greater risk of introducing microorganisms into the air—and your lungs—so these humidifiers must be cleaned and disinfected regularly. With this fourth type of humidifier, the water goes through a pump and is pushed out into the fan blades, which then turn it into a mist and push or "impel" it out into the room. Here, the pump replaces the wick filter. Pros: The cool mist makes this humidifier type safe for pets and kids. It doesn't require a filter and has a very quiet operation. Cons: Use of anything but distilled water may leave a mineral residue inside and surrounding the humidifier unit. There is a risk of microorganisms because the mist isn't heated. For all but the hot water humidifiers, the type of water you use will largely determine whether you have any risk of sending microorganisms into your indoor air. Using water that has been de-mineralized or distilled can greatly reduce the risk of spreading microorganisms or breeding bacteria. For this purpose, some humidifiers also come with special filters or cartridges to aid in de-mineralization. Cleaning your new humidifier frequently is the number one action you should take to prevent the buildup of mold and mildew. Change out the water in the humidifier tank at least once daily. 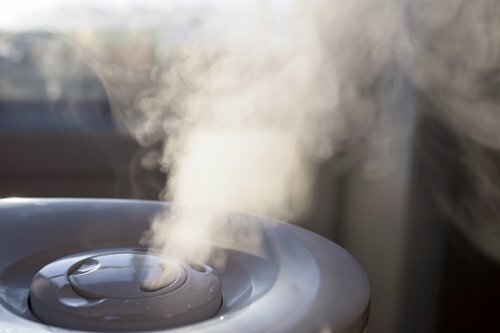 Clean your humidifier every few days (whether you use it or not). You can use hydrogen peroxide or vinegar diluted in water for basic cleaning. Every couple of weeks, you can use a splash of bleach in water to sanitize your humidifier. Be sure to rinse the humidifier thoroughly after this cleaning! Change the filters (if applicable) per the manufacturer's instructions. Be aware that even if your humidifier is labeled "antibacterial" or "antimicrobial," it should still be cleaned regularly. By nature of its purpose, any humidifier comes with the risk of mildew and mold buildup in and around the area where it is used. But there are some ways you can reduce the risk of mildew and mold without sacrificing the health benefits of your new humidifier. Keep the area around your humidifier clean and dry. Locate your humidifier in an area without carpeting, draperies, or other cloth furnishings or accessories. Clean, dry, and store your humidifier when you do not need to use it. Adding a central humidifier system to your HVAC system carries very low risk of mold and mildew growth and can humidify your entire house safely. As a bonus, these central systems greatly reduce the need to use water for humidity. Use a hygrometer (an inexpensive measuring device) to measure the humidity of your indoor air. By understanding the health benefits a humidifier can add while also minimizing the risks, you can learn to safely humidify your indoor air without risk of mildew or mold. If you need assistance with this process, please call us at 905-544-2470 or contact us online via our contact page.